Tagged Change, Confessions, Faith, Fear, Prayer. 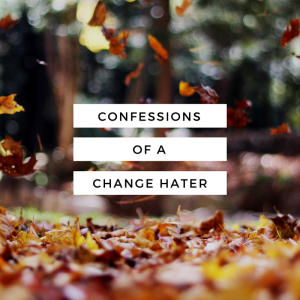 As a fellow change-hater, I loved this post! Thank you for sharing your experiences, Amy, I’m glad you’ve been able to find some peace despite all the changes you’ve had to deal with. That would be so hard for me, too – I get thrown off just from my kids’ schedules changing! Kiddos’ schedule changes are the worst — especially when it’s Daylight Savings Time and they wake up at 3am. *sigh* 😉 Thanks so much for reading, Laurie. I’ve been learning this lesson anew myself. Thank you for this reminder, which I have needed. I’m glad I’m not alone. Thank you for reading, friend. This made me smile. Change is so hard for most of us. For the last two years I’ve been living in Illinois, so foreign to this desert-dwelling Utahn. It has been an adjustment, but not without its share of blessings. Look how adaptable you’ve become! The midwest would definitely be a change from Utah! And I agree, there are so many blessings, if I just take the time to look away from my unhappiness. I sure hope I’ve become more adaptable! Thanks, Denise. It’s very challenging to change. Thank you for sharing your ideas here and for encouraging us to be open to the idea that our timeline is not always the timeline we must travel. It’s been so helpful to me to see here that I’m not the only one who stuggles with it. Thank you for reading, Denise. I’m so glad it was encouraging. It all depends on the change if I hate it or not. When you have a special needs child with uncontrolled seizures, you live with Plan B, C, D, and Z all the time. 🙂 The thing is, that doesn’t bother me so much. What bothers me is when someone is in MY pew in church. One or two rows difference isn’t a big deal, but having to sit on the opposite side? It’s like being in a new church. Ha! I think the hardest thing with change is that you often have no control over it and that can be real scary. Even though we’re told to not be afraid in Scripture hundreds of times, when the change is staring you in the face, it’s hard to clamp down on the fear. Really, God sometimes allows for some horrible things, right? Been there. And for me, it’s stretched and grown me in ways I never dreamed, and through all the changes in my life, God has never let me go. I’m still here. You are a rockstar at dealing with change! And isn’t it funny that the seemingly small adjustments sometimes cause loads of irritation? I agree that it’s the lack of control that scares me the most (maybe my confession should’ve been I’m a control freak). And I’m so glad you’re still here. 🙂 Thank you for your insight! My boyfriend hates change and I always roll my eyes at him because I’m one of those people that loves to mix it up! However as I read this I was surprised, because even though you and I seem to be opposite in our feelings toward change, we had to learn the same lesson. I love giving God suggestions on how I’d handle certain situations. But this last year things haven’t changed the way I’d like so I’ve had to surrender to Him and trust that He knows best. Thank you Amy for giving me a new perspective! I hope God continues to bless you wherever you may be! I so love that we are both learning the same principle, from differing ends of the spectrum. Isn’t that just like God? I am glad that you found some encouragement here. Thank you so much for reading. Thanks for sharing! I’m one of those “loves change” people, because I do get bored with routine and I enjoy the pressure of fresh challenges. Which means God tests me by making things not change as fast as I’d like — or not change at all! 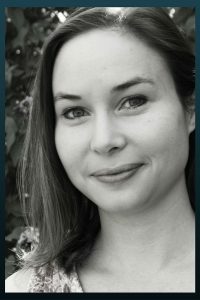 My husband and I married thinking we would be moving all over the mission field and instead God has planted us in the most ‘common’ places for the long-term and said “grow here.” It grows me in the same way as your moving grows you, and I’ve developed an appreciation for consistency, routine, and structure — plus it means I can BE the change in the area where I live. This was good to read, as I am considering a move. One of my girlfriends gave me an affirmation the other night — she said “everything we do can be with grace and ease.” I would not have the blessings I have now in my life if it were not for the willingness to change, to face the things I do to hold myself back. So I appreciated this post very much. God is good. I started reading and thought, wait, how does she know everything I’ve been thinking? I just got married and moved twelve hours from my growing up place, and I’m trying to move past the toddler stamping her foot stage. Thank you for these encouraging words! I want to grow in this new place and become more than I ever could be in my old comfort zone. Transitions can be difficult, but also bring blessings, as you mention. I think I’m usually of the opposite mindset, feeling restless if in one place too long. And what a gift to have friends and family that we long to see.